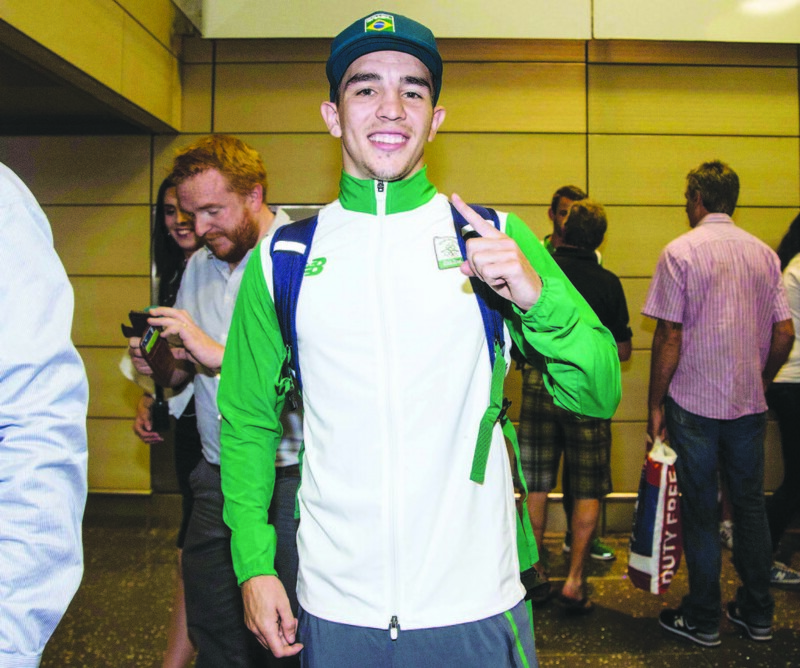 DESPITE his Olympic Games heartache, there are options aplenty for Michael Conlan as he gets set to enter the world of professional boxing. Promoters on both sides of the Atlantic have been in contact with the West Belfast man since the shocking decision in the bantamweight quarter-final against Vladimir Nikitin went against him, but despite not coming home with the gold he felt was his destiny pre-Games, his reputation has not been diminished at all. The 24 year-old will campaign at super-bantamweight when he makes his debut, possibly before the end of the year but for now he is exploring the many options in front of him with Golden Boy Promotions, Top Rank, Al Haymon and Frank Warren just some of the names believed to be after his signature. “I have been getting offers from the big promoters in America,” revealed the vastly talented world amateur champion. “Eddie Hearn hasn’t been on yet but he has started following me on Twitter and Instagram so maybe he will contact me too. “Frank (Warren) has been on to me, lots have been on so I know I have a lot of options. I’m happy with that. “The more I think about it, I could be in the ring in December. Certainly, a break for now is well deserved for Conlan who put so much effort into his preparations for Rio that of course ended in controversy against Nikitin. Many felt that Conlan had not just won clearly, but in real style as he produced some brilliant boxing. Ever the perfectionist, he doesn’t feel it was his best even though he had no doubts about the result. “People have said they think it’s the best they have seen me, but I don’t think it was the best I have boxed,” he opined. “Even at that, in the first round I thought I was in second gear as it was that easy. My movement and timing of him was brilliant. I thought I was making him look stupid. “Then I came back (to the corner) and I was down, so it was devastating. Indeed, the decision of all three judges to award Nikitin the first round was remarkable given the Belfast mad had dominated and was perhaps a sign of things to come. However, despite the warning signs, Conlan says he wasn’t too concerned at that moment. “During the fight I was just totally focussed, but when I found out the score (after round one) I went ‘what, I thought I won that easy.’ They (coaches) then said I was going to have to go forward and that was no problem. I did that and evened it up,” he continued. “I thought then ‘this is it, he’s going to be wrecked this round’ so I did the same again. “Although the last round was closer than the others, I thought I did enough to win as I was landing punches and towards the end, I just stood back and was catching him with straight shots. I felt at ease. The outcome is by now well known as-well-as Conlan’s furious reaction after. There were claims soon after the bout that members of the Russian coaching team had informed their Irish counterparts before the fight that the result was already known and Conlan confirmed this to be the case. “The coaches heard two days before, but they didn’t let me know,” he stated. “I was focussed and believed I was going to win, but when I heard that after it sickened me even more. “I did go mental and I did say some crazy stuff, cursed as well but I wouldn’t change it. “I do cringe a bit when I watch it because of how bad I go, but they were my true emotions. “I was being honest with myself and the rest of the world who watched. Reaction The reaction on social media immediately after the bout told its own story with media, fans and some of the biggest names in professional boxing including Paulie Malignaggi, Sergio Martinez, Mikkel Kessler and Darren Barker just some of those who posted messages sympathising with Conlan. He says those messages helped him get over the crushing disappointment of having his Olympic dream taken from him. “When people of their calibre are Tweeting me and Tweeting about me, I did make it a lot easier,” he added. “These guys are boxing professionals, they know what they are talking about and have been around the game for a long time, longer than me. One person who didn’t agree with the Conlan viewport has of course been Dr Ching-Kuo Wu, president of AIBA who has threatened Conlan with punishment for his reaction in Rio. However, given the West Belfast man will not box under the AIBA banner again and instead join the pro ranks, those threats seem rather pointless. “I don’t know what their sanction would be even, whether a fine or whatever. If it was a fine I would tell them where to put it because I won’t be paying it,” Conlan stressed. With the Olympics now a memory, Conlan can look forward to the next chapter in his career that is sure to bring further glory after his Rio disappointment he will not have fond memories of. “I’m delighted to be back now,” he confirmed.